Now there is the best reason to sew. Having a precious model. Our little model Evamarie, was born yesterday weighing 8# 10oz and 21 inches long. She has the best mommy and daddy. They are so in love. She is wearing her Mimi-made first posted here. 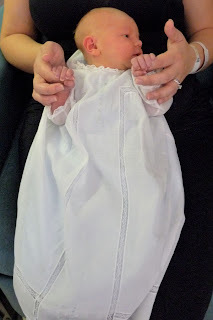 This gown is Old Fashioned Baby Antique T-Yoke gown in white Swiss batiste. Her slip is blue Swiss flannel both trimmed with Maline lace. Here is a full length view. Love her! And so does her mommy. Martha......she is beautiful!!!!! As is the gown!!! Take your time and enjoy her!!!!! Eva Marie is stunning in her grandma made. Stunning. just so sweet and well worth the wait! That gown is gorgeous but then we knew it would be! Well, I am pleased as punch to see your little sweetheart in one of my gowns!! It makes me feel related to her! And she looks pretty pleased to be here. Unusual for one so soon out of a warm comfy womb!! She is beautiful, and I love seeing her in one of your special made gowns. I'm a "Mimi" too! Love her... aren't they the best?? just too precious for words!!! enjoy those loves and smoooches!!! Oh, what a precious baby in a beautiful gown! What a sweet, beautiful baby angel! What a beauty, and the dress too! What a sweet pea! And so blessed to have you sewing for her! Oh Martha, she is so precious!!! Evamarie is simply delicious! Enjoy every blissful moment of your new grandbaby! 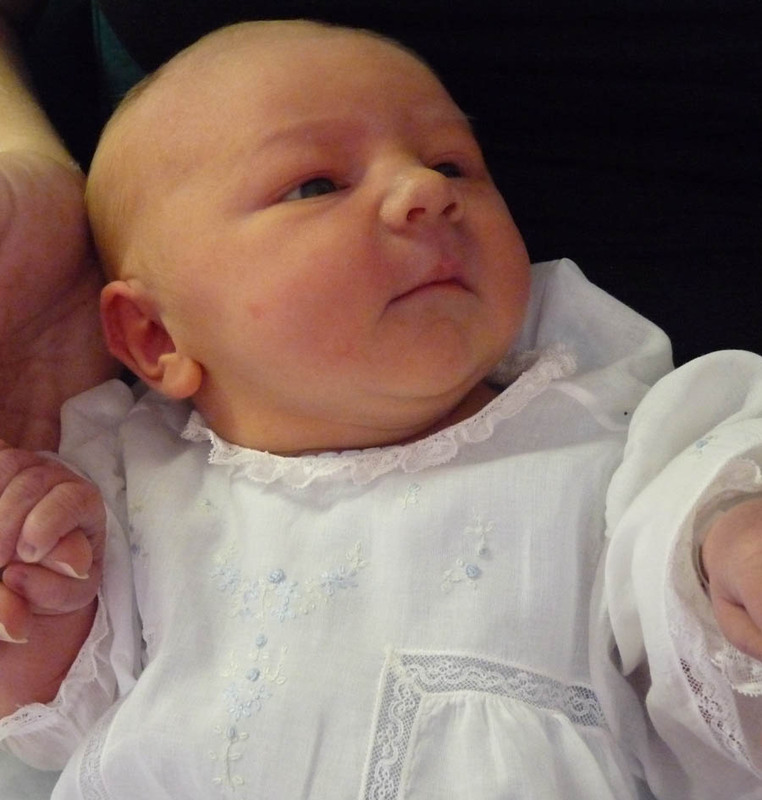 Evamarie is a beautiful name for such a precious little one with such a darling gown! I'm going to suggest this name to my daughter whose baby girl is due in about 8 days and who doesn't have a name picked out, yet! The gown looks absolutely precious on that darling blessing of yours! I am so thrilled for you and your family, Martha! Congratulations on the blessing of Evamarie. SHe is BEAUTIFUL!!! And so is the gown. wow!!! This is going to be such joy to see her grow in style!